You are looking for a line that has IPv4 Address followed by four numbers with dots between, similar to the numbers before the colon in the command above. Again you are looking for the same dotted number, this time it will be after inet. In both examples, you might have several to choose from depending on how many network cards (real or virtual) your computer has. Determining which one is which is probably beyond the scope of these instructions! If you get the IP address completely wrong, the command will fail with the error: Error: That IP address can't be assigned-to. Set the number of workers (concurrency, -c) as you see fit. The more you have, the more processes (imports, exports, query-retrieve operations etc) can take place simultaneously. However, each extra worker uses extra memory and if you have too many they will be competing for CPU resources too. 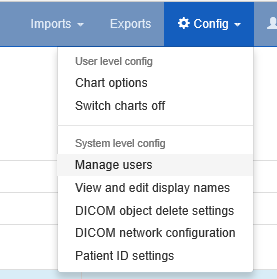 After the first users are configured, this link will no longer be presented and instead you can go to Config -> Manage users. 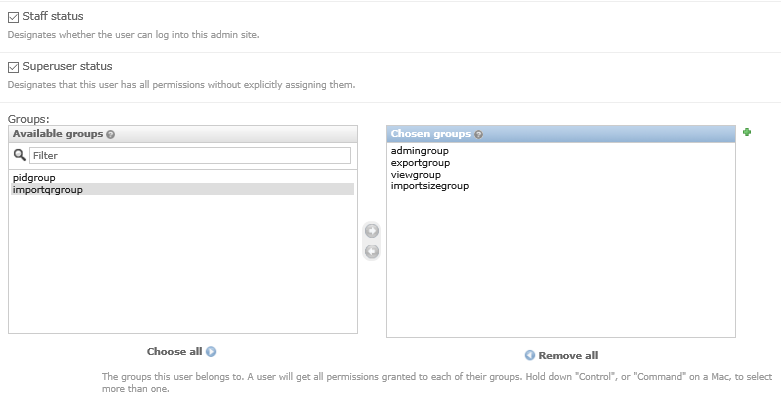 In a production environment, Celery will need to start automatically and not depend on a particular user being logged in. Therefore, much like the webserver, it will need to be daemonised. For now, please refer to the instructions and links at http://celery.readthedocs.org/en/latest/tutorials/daemonizing.html.